Product Description: American Motors AMX: AMX -- One of the greatest super cars ever built, for the street or the track, and the first two-seat sports car built since the Corvette and the early T-Bird. In its two years of manufacture, close to ten thousand of these lightning-fast cars stuffed a lot of wisecracks about Ramblers being slow and boring. 315-horse 390s backed up by close-ratio 4-speeds will shut a lot of people up, you know. 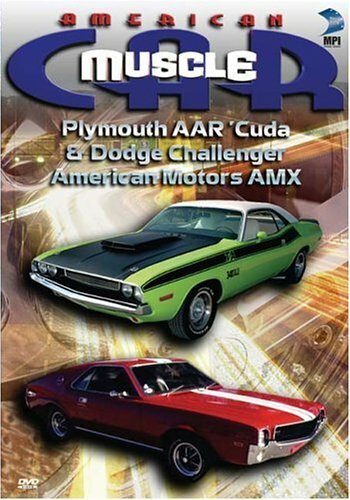 Plymouth AAR 'Cuda and Dodge Challenger T/A: SPORTY CARS -- With a little help from Dan Gurney, Chrysler Corporation turns their 340 'Cudas and Challengers into world-class road racers. After these cars blew off Ford's Boss Mustangs and Chevy's Camaros on the Trans Am circuit, muscle car fans lined up at Chrysler's showrooms for a chance to take them to the streets!